Huge hydropower dams in the Amazon rainforest aren’t just bad for Indigenous communities, biodiversity and the climate – they’re bad for the companies involved. Here’s why. The Amazon is the world’s largest remaining area of tropical rainforest, but every day it gets a little smaller – while big business profits get a little bigger. Over 750,000 km² of Amazon rainforest (an area larger than all of France) has already been destroyed by industrial agriculture, cattle ranching, illegal logging and infrastructure projects. And new threats keep coming: this time in the Tapajós River basin, one of the most biodiverse areas of the Amazon rainforest. What’s happening in the Tapajós? The Brazilian government is planning a massive hydropower project for the Tapajós basin – over 40 medium or large dams, including one 7.6 km wide mega-dam. This dam alone would flood an area of rainforest the size of New York City, threatening the livelihoods of the Indigenous Munduruku People who have lived along the Tapajós River for centuries. The mega-dam – called São Luiz do Tapajós – doesn’t just threaten local communities and ecosystems. It also harms the climate. Building the massive structure produces substantial emissions, as does the decay of flooded rainforest vegetation and soil. So who would want to help build the São Luiz do Tapajós dam? It takes huge amounts of capital and technology from companies all over the world to build a hydropower dam. Greenpeace Brazil has been investigating who might want to profit from this destructive project and released a new report on their findings – and on the risky nature of Amazon hydropower – today. So far, Greenpeace Brazil has found that the São Luiz do Tapajós dam is attracting the interest of a number of Brazilian and foreign energy companies. Global engineering companies with experience working on other controversial Amazon hydropower projects – companies like General Electric, Voith Hydro, Siemens and Andritz – may also be lining up to get involved. None of these companies have announced their intentions publicly yet. But others, like European utility Enel, have come forward to say they won’t be taking part. What’s at stake for companies who get involved with São Luiz do Tapajós dam? The banks, insurers, suppliers and contractors that become involved in Amazon hydropower projects face serious financial and reputational risks. Hydropower dams attract international attention for their destruction to the environment and impacts on local communities. These dams and other large government infrastructure projects have also recently been tied to corruption. Another gigantic Amazon hydropower dam called Belo Monte has already become part of the largest corruption investigation in Brazilian history. Companies paid millions of bribes to obtain stakes in the construction of the complex. For global businesses, investing in Amazon hydropower is a gamble, to say the least. But some companies still may take the risk and get involved. What can people do to stop this? The companies that may help build the Tapajós dam are all over the world. 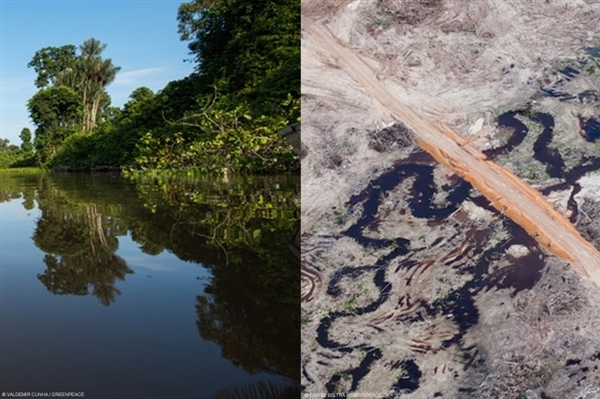 And Amazon destruction impacts all of us, too. People must act globally to stop this global project. Just today, activists gathered at Siemens headquarters in Munich, Germany to shine a spotlight on the company’s potential involvement in the dam. And two weeks ago, Munduruku Indigenous Peoples joined activists in Austria to peacefully protest at the annual general meeting of the Austrian company Andritz. They asked that the company not take part in projects that would destroy Indigenous lands. Brazil’s dash for Amazon hydropower is destined to fail its people while enriching a few. Wherever you are in the world, your voice matters. Add your name to help keep the Tapajos alive! Tica Minami is the head of the Amazon campaign at Greenpeace Brazil.